American Bartending School has a 2 part program. The first part is to train you in every phase of bartending. 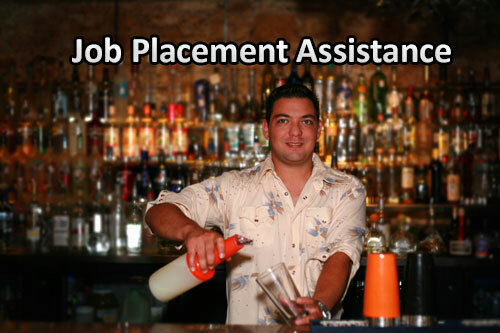 The second part is for our job placement department to help you find a bartending job. American Bartending School in Palm Desert has trained thousands of men and women just like you to be working bartenders since 1969. In only 2 weeks you can be fully trained and ready to start bartending. American Bartending is the nation’s oldest and most respected bartending school. Yes, I want more information about starting my bartending career. "Jackson was a really good instructor. He knew a lot about bartending because he worked for the Ritz Carlton Hotel for 7 years. He gave us great tips on how to give Five Star customer service that I now will help me make more money bartending. The job placement staff helped me get a job at one of the casinos'"
"I really like the class. Jeanie was a great instructor. She cared about us learning bartending the right way. I would definitely recommend school to anyone who wants to get certified"
"Damon was one cool dude. I called him the bear but he was as sweet and gentle as a kitten. He took his time and showed us how it's done in real world bartending. Damon being the food and beverage manager at the airport kept us entertained telling us about his bartending experiences"
American Bartending School is conveniently reached from any of the cities in the Palm Springs – Palm Desert area; including Palm Springs proper, Indio, Cathedral City, Coachella, LaQuinta, Rancho Mirage, Desert Hot Springs, Yucca Valley, and Beaumont, California. Proudly serving the community as the oldest school with behind-the-bar. hands on training classes and bartending job placement assistance.